The Head Coach of the Cross Country team is Coach Ken Lantz. You may contact Coach Lantz on his information page by clicking here. There will be a pre-season meeting in late July for those who wish to run on the Cross Country Team. This informational meeting will be announced through email and posted on the school’s web page and social media outlets. Must have all forms and health physical information filed with the PCA Athletic Office in order to participate. Must be in grades 7-12 for the following school year. Younger students will be allowed to practice with the team, but will not be allowed to compete. Must maintain a passing grade in all classes during the season. Must have a willingness to run and a commitment to fully participate in all practices and meets to the best of one’s ability. Students will be more successful if they have been running all year, but this is not a requirement to make the team. Practices are after school on Mondays, Tuesdays, and Thursdays until the season ends in mid-November. 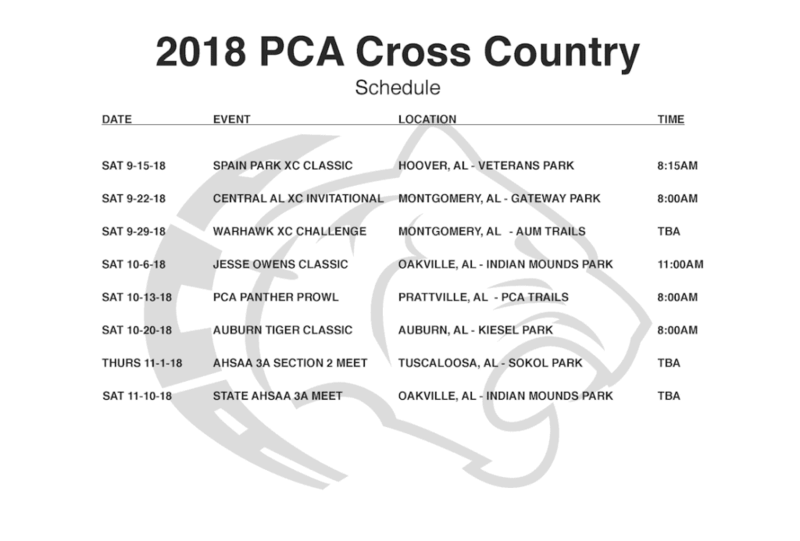 Cross Country Meets are nearly every Saturday from August-October. Middle School athletes can usually choose to race 3K or 5K distances. High school students will race 5K distances. A sturdy pair of running shoes or trail running shoes and running clothing are required. Uniform purchase will be required. They are usually $75-$125 per student. Also, students may purchase their own meal(s) during the meets.